15.8.2018: More and more streaming services offer their listeners curated playlists on various topics. Two GENUIN artists are now represented in the Apple Music "Classical Dinner Party" playlist: Track 3 and Track 6. Giulio Regondis Rêverie nocturne, Op. 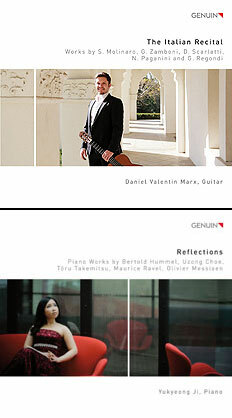 19, played by guitarist Daniel Valentin Marx, and Maurice Ravel's Miroirs No. 1, interpreted by pianist Yukyeong Ji.